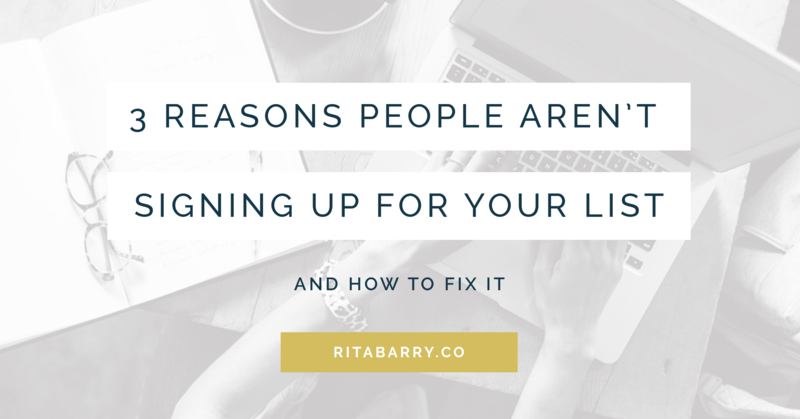 3 Reasons People Aren’t Signing Up for Your List · Rita Barry & Co. Remember back when you were a teenager and your parents were finally away for the entire weekend. The weekend when you invited everyone you knew over for the most epic party. Then as Saturday afternoon turned into evening, you’re left sitting at your kitchen table with your besties and not a single person more? Just me? Ok, maybe that’s true but I know it’s also a common feeling when it comes to getting people on your list. And what’s worse, in list building you can clearly see the “cool kids” down the block who have HUGE lists and have no trouble getting everyone to their party. Email lists are like that, businesses are like that too. Once you get to a certain point of visibility everything gets a whole lot easier. But I’m going to guess that you’re not there yet. You’re at the part where it feels like you have to beg people to type their email into that little rectangular box – and that’s not a great feeling. So let’s try and make some headway on this! One of the trickiest parts of list building is that most of what works really well seems totally backwards, so it’s easy to do the exact wrong things. If you have some traffic coming to your site but no one’s signing up for your email list, there are likely 3 big reasons why. You may have one or all 3 of these issues going on – take a look and see how you can make some small tweaks that can have a big impact on your website to subscriber conversion rate. In website design, in content, in life in general, less is almost always more. Overwhelm can kill your list sign ups in 2 different ways. Take a quick look at your homepage, or an inner blog post page, how many things (links, images, ads, etc.) could a visitor click on at any one time? 10? 20? More? If there is too much to click on, visitors click on nothing. Usually, displaying #allthethings comes from a good hearted place, you’re trying to help a visitor see all the opportunities that are available to them, but in reality, that’s not the best way to display information for the human brain. Instead, think of what your priorities are for each page on your website. What’s THE most important action you want people to take? Start stripping away the extraneous images, links and clickable items that don’t support your priorities and you’ll be amazed at what this little bit of focus can do for your optin rate. We all LOVE our businesses and get really excited about our topics. Plus most of us eat, sleep and breathe our topic material. So it’s natural, to want to share all the things you know! Your lead magnet however, is not the place to share all those nuggets of wisdom. Writing a 90 page ebook or having a 30 day video course is way over delivering. Not only does it take you a long time to produce, it’s not something that the majority of people are going to want. People want quick wins, actionable tips. Things that move the needle in their lives – and quickly. Things like checklists, cheatsheets, step-by-step blueprints, templates, swipe files are all good lead magnet starting points that aren’t overwhelming and help your audience achieve something useful. The goal is to get people to use the tips you provide in real life so that they feel a connection to you and start building a relationship. Too much info will have the opposite affect. It’s easy to forget that when people arrive on your site, they’re (A) not usually landing on your homepage and (B) they’re looking for something. With those sorts of specific needs, it’s no wonder that a general lead magnet about a general topic you talk about doesn’t convert very well. Instead, try matching lead magnets to specific traffic sources or specific content. This doesn’t have to be as challenging as it sounds with a bit of software help. With solutions like Optinmonster, you can create optin forms that only appear on certain pages, certain blog post categories, from certain referral sites and more. Or maybe your blog has 3–5 main categories of content. What super valuable, quick win kind of lead magnet could you make that matches up with each of those categories? Just imagine how much better your sign up rate will be with a lead magnet that complements your content rather than one that interrupts it. One of the most important parts of any website – are the words. They are one of the most overlooked parts of any website as well. Graphics, video, web design and imagery get all the attention but it’s your words and your stories that are going to do a lot of the selling of your products, services and free lead magnets. Talking about what your lead magnet IS instead of talking about what your lead magnet DOES. It’s about focusing on benefits and solving problems rather than the features of the lead magnet. This can be a bit tricky when you’re not used to writing persuasive copy (copy that tries to persuade people to do things – sales pages would fall into this category too.) And don’t feel bad if this is hard for you, copywriters spend decades on their craft! An easy way to think of this is how someone would Google the problem your lead magnet fixes. They won’t Google – I want a 30 page pdf, that’s kind of silly, right? No one needs one of those! But they would Google, meal plans, menu planning, weekly meal plan, monthly menu planning or things like that. This is more the type of language you want to use in the copy around your lead magnet! 2. Redo your lead magnet into something super short but incredibly useful if you have an overwhelming brain-dump of a lead magnet right now. 3. Brainstorm 3+ lead magnet topics you could use on your blog that are hyper-specific to blog posts or your blog content categories. Create really short, but super helpful (I hope you’re seeing a theme!) lead magnets for each idea and add them to your website. 4. Check out the copy around your lead magnets – how do you describe them? Retool your “sales” pitch to include benefits and solutions for your reader.